I have always loved beef noodle soup. It’s easily one of my five reasons to drive to San Gabriel Valley. Before my trip to Taiwan, however, I had associated a proper bowl of noodles as having a deep, dark broth and good amounts of chili paste and oil floated in it (latter of which is added by myself). In the beginning of my trip, spent in the southern cities of Taiwan, I even had homemade Nu Riu Mian. Actually, that’s not entirely accurate. It was homemade in the sense that the broth and beef had come from a frozen packet bought at the Kaohsiung Costco, whereby you add your own, fresh noodles – and greens, if you wish. If those were available at the Culver Costco, I would become probably the only CostCo member to occupy a 1-bedroom apartment shoebox in a heartbeat. Alas, I was left to satiate my beef noodle soup cravings – along with other requisite dishes – to the best of my ability during this trip. I saved the restaurant version for Taipei, which is the city to consume a bowl as the dish is a Chinese import.Â It’s a specialty particularly in the capital city,Â as evidenced by their yearly Beef Noodle Festival. Thanks to the recommendation of Danny (KungFoodPanda), the small shop specializing in the bowl of noodles was one of my favorite stops, period. The Taiwanese in the States – and Taiwan, apparently – love acronyms, and the name of the shop was no coincidence since for their most popular bowl of soup, the broth takes 72 hours to complete. It’s also named in allegiance to its Anglo phonetics, though it was my mother whom I have to thank for translating so that I could understand the process. It is unlike any other bowl I’ve had – in both taste and color – and the broth’s complexity pretty much blew me away. The housemade noodles were also excellent and springy, tossed with slivers of fresh ginger. 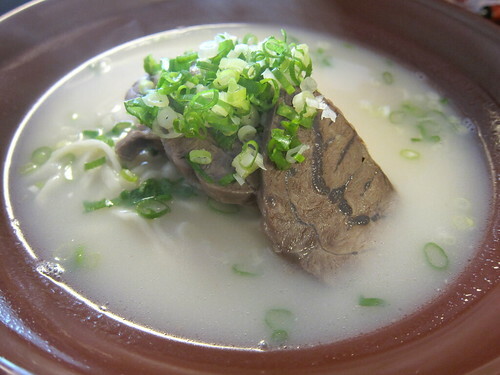 The beef tendon atop the clear broth was super tender. 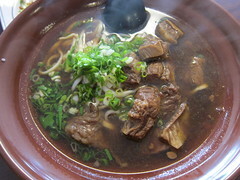 The traditional dark broth (with braised chunks of beef as opposed to the tendon)Â may be the more favored flavor in general, but there was good reason to wait that extra half-hour before the “clear broth” was declared ready by the shop owner, proving that they really take their broth seriously. It is the dark broth at 72 NRM that is ready at all times. Nevertheless, I showed restraint and kept my hands off the jar of chile paste on the table so that I might really taste the essence of the broth. It was the most flavorful yet seemingly effortless bowl of beef noodles I’ve ever had. Sometimes, in a less refined broth, I’ll find that there’s a bit of precipitate to the texture – but this broth was basically seamless with its rich flavor completely integrated. The clear broth still had more, but with that being my first bowl ever, I wouldn’t feign any sort of expertise. It stands that it had eye-openingly complex broth and amazingly fresh noodles. The process of this broth – and the fact that it takes 72 hours to make – was intriguing enough to ask my mom for a translation. Apparently, the ingredients are simmered in cold water the entire first day. Then the temperature is brought to a medium heat during the second day in order to break down the grease. Mild heat is used on the third day in order to bring out the flavor. 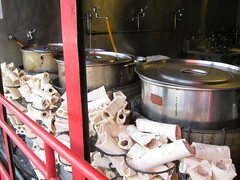 One and a half pounds of bones are used to make each bowl of broth. The flavors are so rich that you will “still be savoring [them] for 2 hours” after you finish your bowl. This entry was posted in Food, Taiwan, Travel and tagged 72 NRM, beef noodle soup, broth, clear, dark, Food, niu rou mian, noodles, soup, Taipei, taiwan, Taiwanese. Bookmark the permalink.